The day-use area in this park has been closed. We apologize for any inconvenience this may cause. Visitors can still view Bear Glacier from Hwy 37 pull-out located directly across from Bear Glacier. For an alternative day-use picnicking area, Meziadin Lake Provincial Park is located approximately 30km east of Bear Glacier. There are also several spots in the nearby communities of Stewart, BC and Hyder, Alaska for visitors to enjoy camping and picnicking. Bear Glacier is a destination for travellers heading north on Highway 37. Just a short side trip on Highway 37A towards Stewart, the Bear Glacier descends towards Strohn Lake, down Bear River Pass. Ice once filled all of the pass, but in the 1940’s, the glacier began to retreat and Strohn Lake formed in the exposed basin. In 1967, Bear Glacier melted away from the valley wall and Strohn Lake was no longer dammed. Since then the glacier has continued its retreat. Bear Glacier Park is located on Highway 37A, between Meziadin Junction and Stewart. The closest community, town and city is Stewart. History: Ice once filled all of Bear River Pass. In the 1940’s, Bear Glacier began to retreat and Strohn Lake formed in the exposed basin. Acting as an ice dam, the glacier prevented the lake from draining down the Bear River Valley. If enough water collects behind an ice dam, a glacier may begin to float. Water flowing under the ice quickly creates a large tunnel. The lake empties, the ice dam resettles, and water again begins to collect until another flood is triggered. Five times between 1958 and 1962 Strohn Lake emptied underneath its ice dam in a catastrophic tumult of muddy water, rock and ice. This type of flood is known by the Icelandic term “jokulhlaup.” In 1967, Bear Glacier melted away from the valley wall and Strohn Lake was no longer dammed. The threat of sudden destructive icy floods in the Bear River Valley disappeared with the glacier’s retreat. 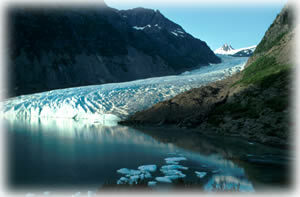 Bear Glacier Park was designated as a Class A Provincial Park in 1998. Conservation: Bear Glacier Park lies within the Nass Wildlife area and protects part of a large glacier and a glacial lake.